A self-contained, Light and Sound Rainhead module that creates high-intensity chromatherapy lights and sounds. Rainhead is rated at 2.0 GPM Max. at 80 PSI and requires a separate diverter port with shut off valve. Powered by: provided 24V DC, 30 Watts Max power supply. 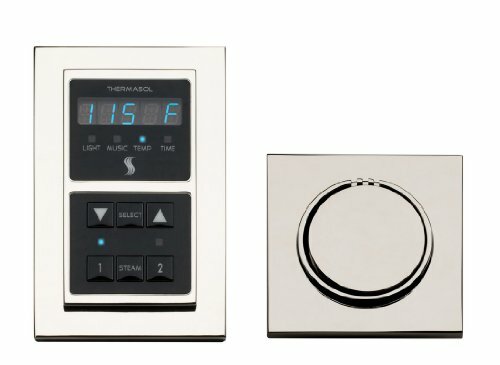 The ThermaTouch Control is a 7” LCD Touchscreen Control used to operate other ThermaSol modules such as Steam Room functions, Light, Sound and Tranquility Visualization, Stereo Audio output and Ethernet connection. The control is approx. 8-1/8” Wide X 6 – 1/8” High X 2 –1/2” Deep. It requires a wall cutout 7-3/8” Wide X 5-3/8” High and must have a clear in wall depth of 3-1/2”. 5-3/4”L x 3-3/4”W x 1-1/2”H Body. This PDM requires a Thermasol Steam Generator and/or Light and Sound System and separate power supply for proper operation. The user interface control shall be dimensioned approx. Ø3.5 x 0.65 Inches. The Control shall be made from billet aluminum and include the ability to turn-on steam remotely with use of a 100% networked digital technology 8-1/2”L x 5”W x 2-1/2”H Body. This Wireless Module requires a ThermaSol Steam Generator and/or Light and Sound System for proper operation. 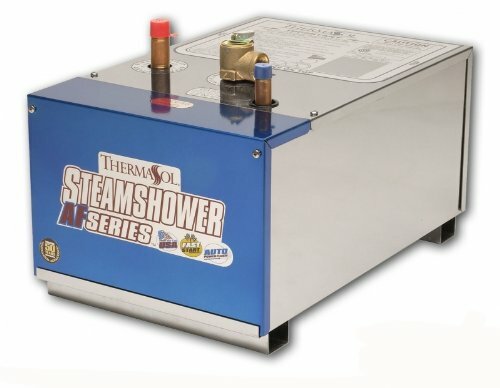 The Thermasol SEM-NTS-PC is a signature series modern digital controller and steamhead kit Polished Chrome. This kit features an adjustable temperature control, and has 2 memory settings for customization. It is compatible with both Pro and AF series generators, and features an all-metal construction for long-lasting durability. It also comes with a day clock for convenience, and has a patented notouch retractable steamhead with an integral aromatherapy well and a sleek, slim design for safely and quietly dispensing steam. The Thermasol SEM-NTS-PN is a signature series modern digital controller and steamhead kit Polished Nickel. This kit features an adjustable temperature control, and has 2 memory settings for customization. It is compatible with both Pro and AF series generators, and features an all-metal construction for long-lasting durability. It also comes with a day clock for convenience, and has a patented notouch retractable steamhead with an integral aromatherapy well and a sleek, slim design for safely and quietly dispensing steam. The Thermasol SEM-NTS-ORB is a signature series modern digital controller and steamhead kit Oil Rubbed Bronze. This kit features an adjustable temperature control, and has 2 memory settings for customization. It is compatible with both Pro and AF series generators, and features an all-metal construction for long-lasting durability. It also comes with a day clock for convenience, and has a patented notouch retractable steamhead with an integral aromatherapy well and a sleek, slim design for safely and quietly dispensing steam. 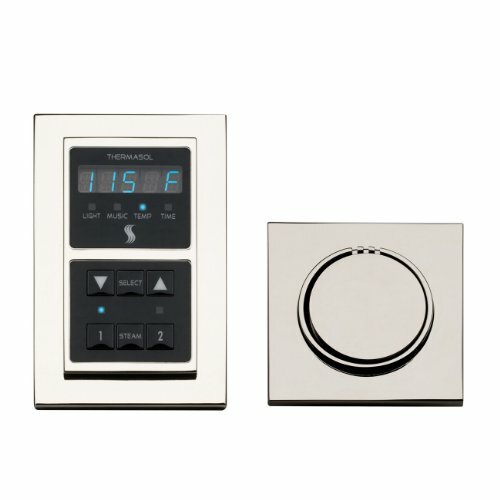 The Thermasol SEM-NTS-SN is a signature series modern digital controller and steamhead kit Satin Nickel. 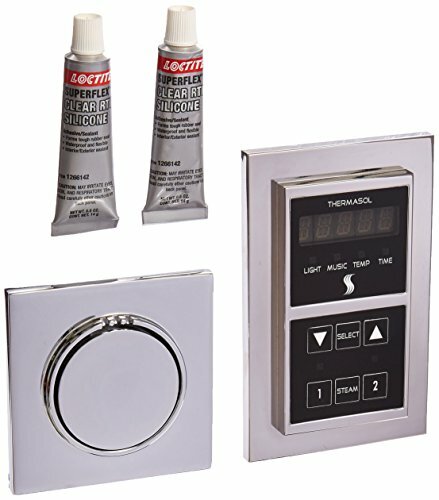 This kit features an adjustable temperature control, and has 2 memory settings for customization. It is compatible with both Pro and AF series generators, and features an all-metal construction for long-lasting durability. It also comes with a day clock for convenience, and has a patented notouch retractable steamhead with an integral aromatherapy well and a sleek, slim design for safely and quietly dispensing steam.